Even in celebrity life, few compare to the closet of Carrie Bradshaw. I once cried because I had no good shoes… and then I finally got a really cute pair of Olivia flat black flats and realized that I had nowhere good to put them – and the tears really began to gush. And it’s true. You could own the greatest fashion accessories from the best fashion designers around the world, but if you have no way to care, upkeep, organize and display them, you are not going to enjoy them as much as you could (much less even remember you have them). One of the things that give me the incentive to improve on my own closet – is looking at someone else’s example that is truly inspirational. It is even more inspiring when that closet comes from a recognizable female figure I truly admire. And yes, there are even some very inspirational examples from women I don’t exactly admire – but I do admire their closet, so at least we have that much in common. If I win the lottery this year – I will build one of these magnificent closets. Can you guess which one? Yes, it will be all of them – if I don’t go bankrupt first. Lauren Conrad (star of The Hills) has a beautiful closet that’s all class and style, mixed with a good dose of complexity. Kim Kardashian’s closet has everything a girl could need. And what it lacks in size (compared to some), it makes up for in quality. The closet of Jennifer Lopez almost looks like a department store. No wait, let’s call it a slice of heaven. Chrissy Teigen is one of my favorite celebrity personalities, and wouldn’t you know that her closet is full of personality too. This is the closet of Tamara Mellon (co-founder of Jimmy Choo shoes). It can be found in her Upper Eastside penthouse. Amazing doesn’t always have to start in the bedroom. Kiera Douglas put this closet (also shared with hubby, Harry) inside an office room. You know that you’ve made it big when your closet contains sub-sections of closets, like this dedicated fitness closet by Khloe Kardashian. If you think the Academy Awards features a lot of gold accents, just have a look at Mariah Carey’s shoe closet. 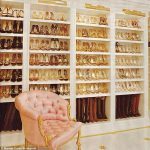 Probably the most infamous subsection in the female celebrity realm is her shoe closet. I wish I could dedicate an entire wing of my home to shoes, but I know that I’ve also got to eat, sleep and shower – so I’ve been holding back. Mariah Carey has a closet that drives us mad with envy. Between her and Jennifer Lopez, I don’t know which one I’d want more. 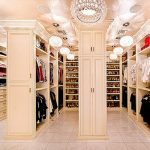 If looking for true closet envy, you might not have to look further than the closet of Theresa Roemer, best known as the “Ultimate Real Housewife of Houston”. With a closet space that is three-stories tall and larger than some small homes, it’s surely one closet of anyone’s dreams, including Mimi and Jennifer Lopez, maybe. Fergie’s closet. Need I say more?